Home » Blog » News » Contest #12. Contest #11 is over. 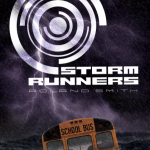 I’ve chosen the a winner I will mail their signed copy of “Storm Runners” on Monday. This brings me to contest #12. The winner will get a signed copy of my new novel STORM RUNNERS. Press the Contest! button on www.rolandsmith.com and follow the instructions. Good luck! ← March 31, 2011. Standing at the desk.